Well, a couple of days ago I was inspired by the “Imagine the Impossibilities” challenge. 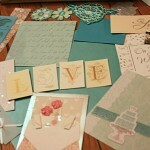 After reading what it was all about, my first thought was of my wedding scrapbook. You see, I’ve been married some time now, and I haven’t even STARTED this book. I bought it 2 years before the wedding (it was too lovely to pass up) and I diligently collected adornments for it until the wedding came. 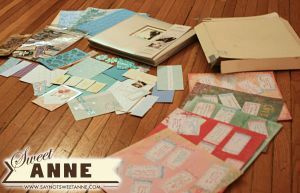 After the wedding, I carefully cut up all of the beautiful cards we recieved and stored them away to be used as embellishments. 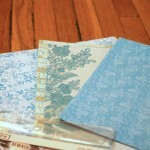 Since then I’ve purchased a couple paper packs to match the scrapbook as well. And that’s all. You see, I havent printed any photos, or even opened the book. It just seems so… impossible. 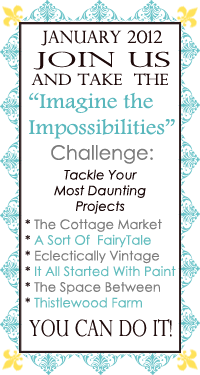 BUT I have resolved to take this project on with everyone else in the “Imagine the Impossibilities” challenge and I’m going to finish it by golly! The whole kit and kaboodle. Pretty daunting isn’t it? 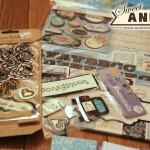 Some embellishments I bought that have been hanging out forever. 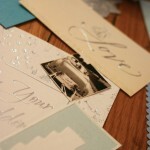 Can you believe the lovely cards we got? What great taste! 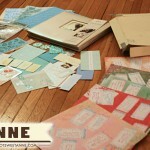 For our Guest Book at the wedding, our guests wrote on stickers and stuck them to scrap book pages. 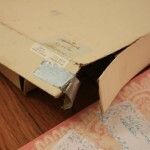 The state of the box is indicative of just how long this thing has been floating around. 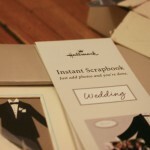 Notice that this is an “Instant” scrapbook. How ironic! The pretty paper I bought to match. 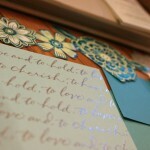 Some of the elements I cut out from my Wedding cards. Thanks for stopping by and I’m glad you joined our challenge! When my twins were born (12 years ago) I made a 1st year scrapbook for each of them and then started family scrapbooks for the years after. Well, that lasted about 2 or 3 years before I was overwhelmed with pictures and life! So I completely understand what you’re going through and can’t wait to see the finished product! Oh man, I don’t understand how people could possibly keep up with that! My mother keeps a giant box of photos under her bed. =D Thanks for the support! Thanks so much! I’m trying REALLY hard to make it awesome! 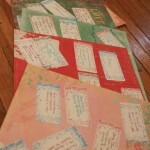 What a wonderful project to pick for the “Impossibilities” challenge! So happy that you’ve joined in with us! Kayla! You have some awesome stuff to work with. I can’t wait to see how it all turns out!!! Thanks so much for posting our button, too! I am your newest follower!